Despite various initiatives, a lack of female representation in fields of science, technology, engineering, and maths persists. This column studies how men and women are affected by various factors when switching out of STEM majors, including their own ability in a subject as well as gender representation within their cohort. Women are just as resilient to negative feedback as men when deciding whether to continue in a field of study, but when faced with additional signals such as an association of the field with masculinity, they appear to become more prone to opt out in response to low grades. Organisations from the National Math and Science Foundation to the American Association of University Women have instituted initiatives to recruit and retain more women in science, technology, engineering, and maths (STEM) fields (Hill et al. 2010). The reasons are multiple and diverse, from helping to close the gender wage gap to hoping that scientific tools can be made more gender conscious (such as adjusting medicine dosages and medical protocols to acknowledge the physical differences between men and women). In recent work, we seek to investigate the question of why there are not more women in STEM fields, given these considerable investments in initiatives to increase female participation in STEM (Kugler et al. 2017). Importantly, we investigate why women switch out of STEM as well as other high-paying majors. Understanding why women and men graduate with different majors is critical for understanding later occupational opportunities and other choices that can influence the gender wage gap. Numerous studies have documented differences in earnings across college majors (e.g. Grogger and Eide 1995). Women predominantly choose majors that lead to lower paid occupations such as humanities, education, and some of the social sciences, such as phycology, while men choose majors that lead to higher-paying jobs. Thus, despite a steady increase in the share of women’s college enrolments (Goldin et al. 2006), the gender gap in wages persists. We use administrative data from a large private university to track students’ choices of major over time, and to understand why students switch major. Previous explanations on why women choose not to enrol in certain majors have focused on poor pre-college preparation, the absence of faculty role models, and the low economic benefits of the major. While we account for all these factors, our focus is on whether women are more likely to switch from one major to another because they are more sensitive than their male colleagues to low grades – an explanation that has been given for why there aren’t more women in the Economics profession. 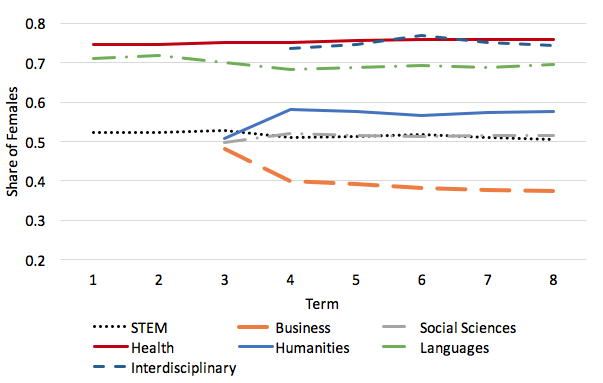 One surprising result, as Figure 1 shows, is that there are a number of STEM majors that are predominantly female. Although men dominate in business majors, in STEM and social sciences there are roughly equal numbers of men and women graduating, at least since 2009. In our data, this occurs because one specific STEM major is female dominated (biology), and several other STEM majors are roughly equal (maths, chemistry, and biochemistry).1 Therefore, the question of why there aren’t more women in STEM certainly cannot be answered by simply focusing on women’s lack of enrolment in STEM majors. Thus, we focus instead on what predicts persistence in STEM and other high-paying male dominated fields. Note: It is common for some majors to be declared later in the studies. The graph depicts shares of females for terms in which there were more than 20 students. Therefore, graph depicts statistics for some majors starting in 3rd or 4th term. To study students’ persistence in a major, we rely on a model developed by Oxoby (2014). In this model, a student estimates her chance of success based on two types of imperfect signals: (1) her ability, and (2) her socio-cultural ‘fit’. We assume she judges her ability based on grades she receives and her fit based on two components: (a) the gender composition of the classes in her major, and (b) stereotypic messages from the broader environment. As students assess their ability and fit, they can develop biases that drive either an overestimation or underestimation of their likelihood of success. What could lead a female to underestimate her chances of success? If, for example, she sees many male philosophy majors, she might underestimate her likelihood of graduating successfully as a philosophy major, even if her grades are high. Similarly, if she hears extensively about the need for more women in STEM, she may internalise a stereotype associating STEM as a set of masculine fields and similarly under-estimate her chance of success. To test these assertions, we use data from a large private university over the 2009-2016 period. Approximately 10% of students change major during their time in college, and 60% of those who switch are women. We control for a variety of factors that, according to prior research, may influence major decisions, including (1) demographic characteristics of a student, (2) pre-college preparation (e.g. ACT/SAT scores, high-school rank), (3) returns to the major, and (4) faculty demographics. We test the predictive value of grades in the major and gender composition of the classes. We also include dummies that indicate whether a major is female or male dominated and whether or not it is a STEM major. We found that all students are more likely to switch to a different major when switching can improve their grade point average (GPA). However, women are no more responsive to poor grades in a major than men are. Rather, both men and women respond similarly. Moreover, women and men both respond more to poor grades when they are in a male-dominated field, and, surprisingly, they respond similarly. Figure 2(a) shows that the probability of switching out of male dominated non-STEM major is positive for women and men, though the difference between genders is not significant. 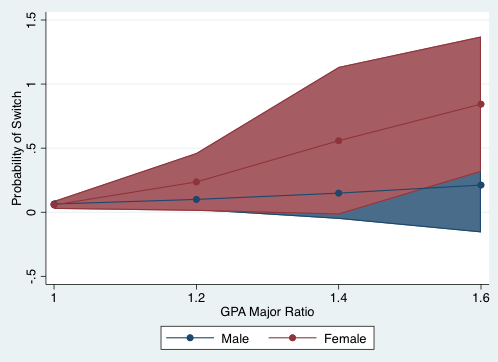 By contrast, Figure 2(b) shows that the likelihood of switching majors in response to improvement in grades is virtually zero for non-male dominated non-STEM majors for both genders. That is, even if women receive the second signal forecasting a lack of future success (because of poor grades and low gender representation in the field) they are still not dissuaded any more than men from pursuing these given fields of study. Yet, women in male-dominated STEM fields were more sensitive to poor grades than males in these male-dominated STEM fields. 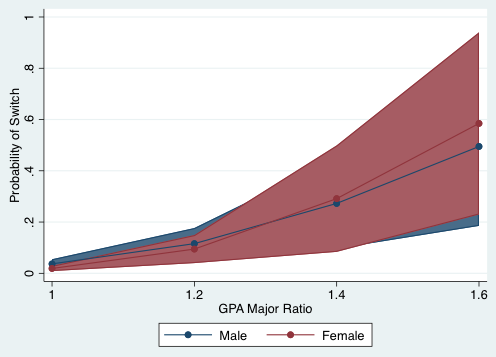 Figure 3(a) shows that women are much more likely to opt out of male-dominated STEM fields when they can improve their grades compared to men. 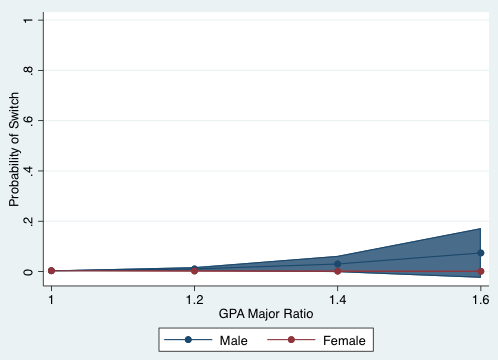 The difference in the likelihood of switching between women and men is between 13% and 60% when the ratio of GPAs varies by 1.2 and 1.6, respectively. 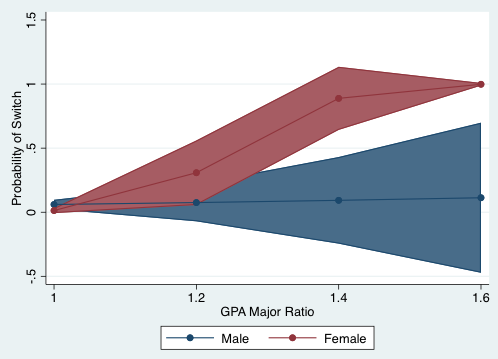 Why do women react differently to low grades in male-dominated STEM majors? One explanation is that STEM fields are associated with masculinity (Francis et al. 2017) and that this stereotype serves as an additional signal to women of their lower likelihood of success in these fields. Thus, while women are quite resilient, when they receive multiple signals about ability and fit, they may eventually tend to opt out. Additionally, we find little evidence that faculty role models or previous preparation are important factors for either men or women. That means that increasing female faculty in male-dominated STEM fields or additional preparation prior to coming to college may not help to retain women in such majors. On the other hand, we find that high returns in a field attract both men and women to male-dominated majors. Thus, providing information on returns can help to change the composition of the field to have more women. Our results show that women are just as resilient to negative feedback as men when deciding whether to stay in a field of study. However, when women receive multiple signals of misfit into a major, they become more prone to opt out of a major in response to low grades. Paradoxically, policy initiatives designed to address the gender gap in STEM majors may continue to promote the stereotype that STEM fields are masculine, and thus have an unintended effect of signalling women an inherent lack of fit. A possible implication of our findings is that it might be more useful to move away from highlighting the lack of females in STEM fields and instead focus on examples of women who overcame the stereotype bias and succeeded in STEM fields. Grogger, J, and E Eide (1995), “Changes in college skills and the rise in the college wage premium”, Journal of Human Resources, 280-310. Goldin, C, L F Katz, and I Kuziemko (2006), “The homecoming of American college women: The reversal of the college gender gap”, The Journal of Economic Perspectives, 20(4), 133-133. Hill, C, C Corbett and A St Rose (2010), Why so few? Women in science, technology, engineering, and mathematics, Washington, DC: American Association of University Women. Kugler, A D, C H Tinsley and O Ukhaneva (2017), “Choice of Majors: Are Women Really Different from Men?”, NBER Working Paper No. 23735. Oxoby, R J (2014), “Social inference and occupational choice: Type-based beliefs in a Bayesian model of class formation”, Journal of Behavioral and Experimental Economics, 51, 30-37. Other research suggests that nationwide women earn more than half the degrees in chemistry and math. For more details, see https://csuglobal.edu/blog/women-in-stem-for-a-gender-equal-society.